Only 1 Tarla Pin Remaining - Buy Today! 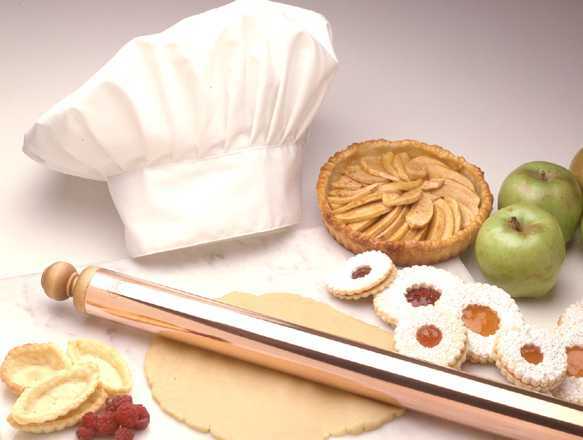 The Tarla Pin is a patented copper and Northeastern hardwood rolling pin with many advantages over old-fashioned, all wooden, ceramic and glass rollers. The most important of course, is that "It Never Sticks!" With the "Tarla Pin" you can say goodbye forever to heavy flouring changing the consistency and taste of your creations and to the cost, mess, and sanitary concerns of muslin rolling pin covers. The secret is the heavy gauge 100% pure copper body and its hand crafted highly polished mirror finish. It retains its coolness, just like a thick marble pastry board, and is especially perfect for dough where it is essential that the butter inside not be warmed. The Tarla Pin is perfect for hot candies as well and partners excellently with marble candy slabs for a perfect result every time. With the Tarla Pin, you simply will never need another roller!